When Kimberly turned 18, Lissa was by Kimberly's side during college. If Kimberly dropped a pencil, Lissa retrieved it for her. If she needed a door pulled open, Lissa assisted. Of course, Lissa continued helping Kimberly make friends, as well. 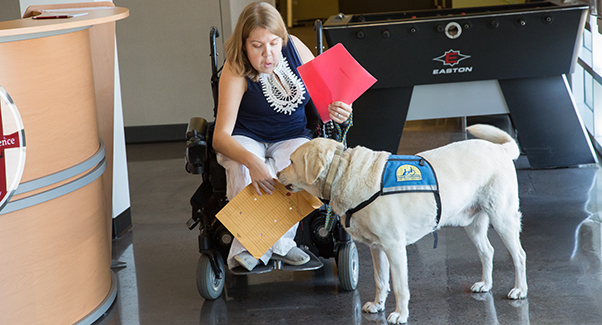 Today, Kimberly is partnered with her second service dog, Karsten. Karsten performs many tasks to assist Kimberly as a working professional in an office environment. Read more about Kimberly as we recognize October as Disability Employment month. This Halloween, give a gift that doesn't result in more trips to the dentist. Send a different type of treat an adorable eCard to someone you love. With your donation in honor of someone special, we'll email a Halloween greeting with your personalized message. Friday, November 3 marks the last National Graduation Day of the year. Help us celebrate another record-breaking number of graduates! There are six ceremonies across the country and it's free to attend or watch online. Get details at cci.org/graduations. Haven't ordered your 2018 puppy calendar yet? Now you have even more reason to: Eukanuba is including coupons with each calendar! For a $25 donation, you'll receive $18 worth of Eukanuba dog food coupons, plus shipping and handling is included! Have you met Foley, Able, Kinkeade or Miller? Follow our blog to see the latest. 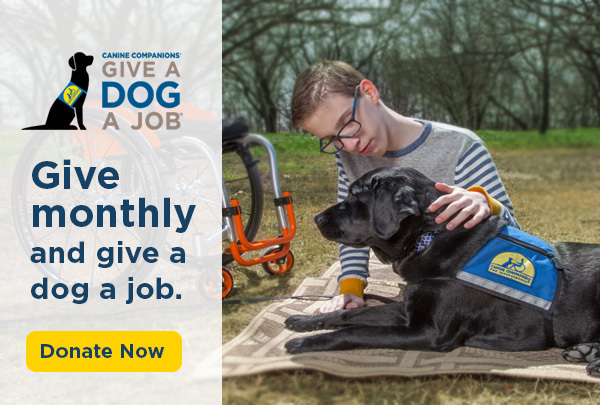 Volunteer puppy raisers are needed across the country - apply today! Get a free t-shirt when you spend $40 or more by 10/31/17 at our online gift shop. Use promo code 1130 for heather white, 1131 for heather gray.